Despite being in the Czech Republic for almost three years, I am still yet to discover much of a vegan community here. In the UK there are millions of social media feeds sharing accidentally-vegan finds, new products hitting supermarkets, and sharing top tips and new eateries. All of these things make me yearn to be back in the UK, and ensure that I always have a massive to-do list (or rather, to-eat list) whenever I pop back. Hence Temple of Camden has been on my radar for a while, and I was very excited to finally get to visit in June. I assume it’s like a vegan KFC, but I’ve never been to a KFC, so I’m not entirely sure if that’s a fair comparison. Basically, the menu is heavy on fried (mock) chicken – burger, wings, and so on. 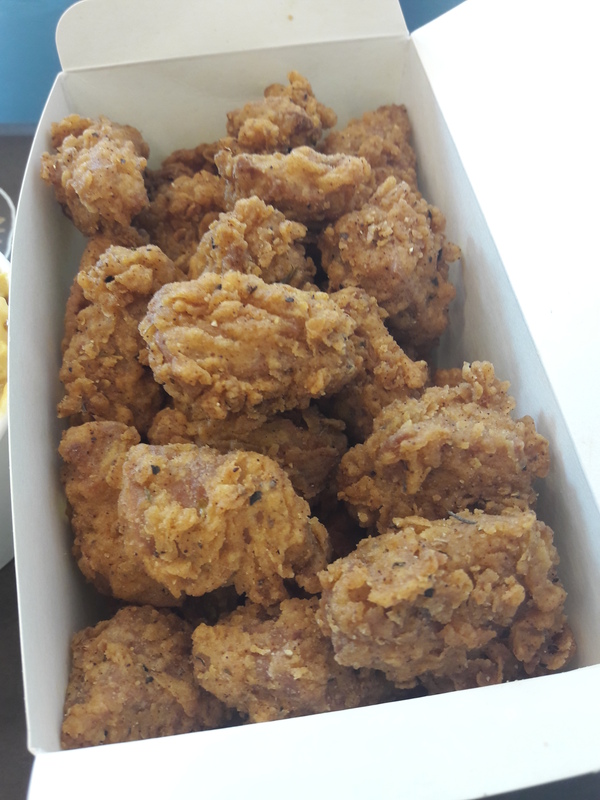 I ordered the popcorn chicken, and got a lot more than I was expecting! The texture of these little bites was perfect, and the coating was beautifully seasoned and really crispy. I can’t even remember the last time I had anything like this, and would certainly recommend it. 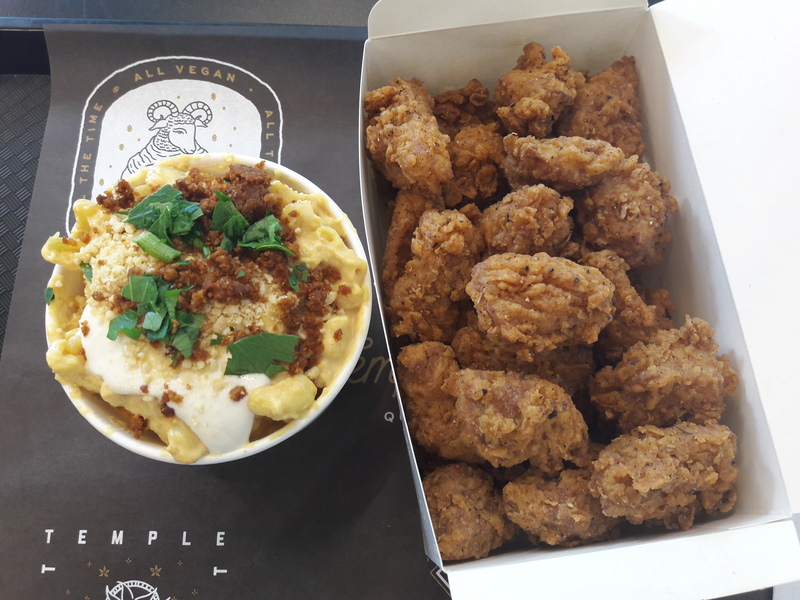 Despite the chicken focus, it was actually the mac and cheese I was most excited about (it’s an all vegan establishment, so nothing to worry about). Sure enough, it was even better than the chicken! The cheese sauce was delicious, and whatever that white sauce is, it was also very much appreciated. The crumbly bits on top were flavoursome and added a wonderful crunchy texture. You simply must try it! I was so stuffed, I couldn’t even manage one of the baked goods from the extremely tempting cake counter. But fear not, I got a couple to take away! 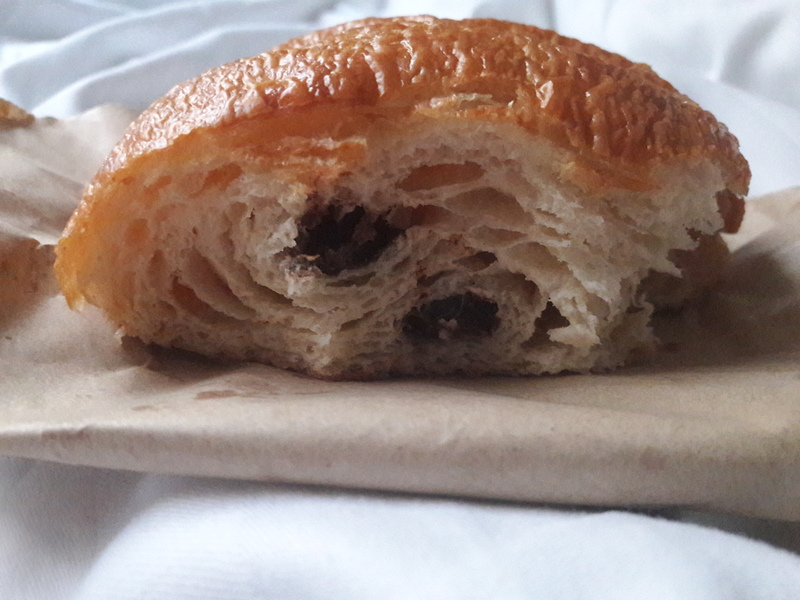 The pain au chocolat was actually a little disappointing -it was quite tough to chomp through, and wasn’t that great eaten cold. I’m sure a little heating would have helped the chocolate to melt a bit and made the whole thing better. No complaints about the brownie though! 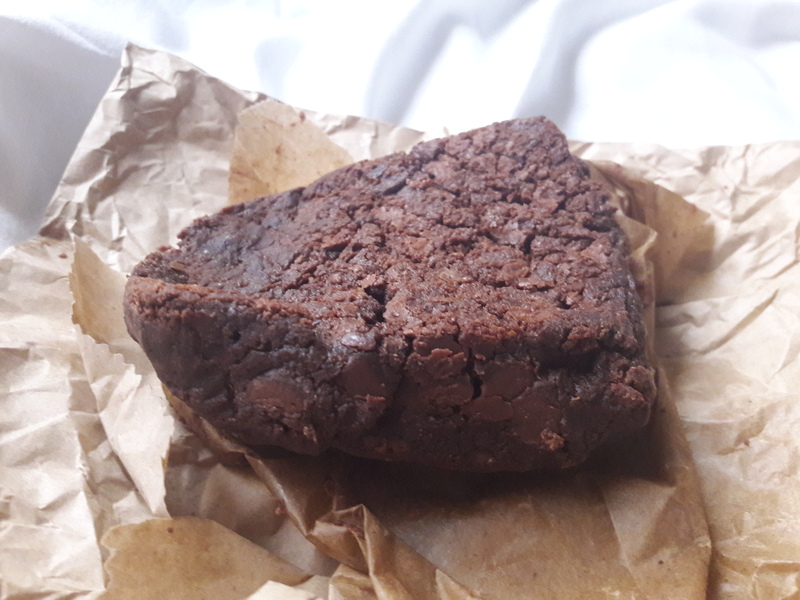 It’s kind of misshapen in this picture because it basically melted in my bag (my bag still smells deliciously chocolatey, so I’m not complaining). It is the most intensely chocolatey and gooiest brownie I have ever had. Also, it’s insanely filling – I had this for elevenses, and didn’t eat for the rest of the day. That could be a good thing if you’re trying to save pennies, but terrible if, like me, your goal is to cram as much food as possible in during a trip to London! So, thank you to the UK vegan community for keeping me posted on this exciting new place! I’m back in London in a couple of weeks, and have a growing list of more places to try! 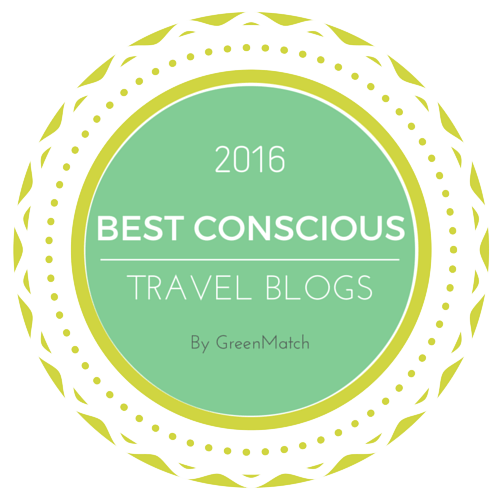 This entry was posted in Travel and tagged London vegan, Temple of Camden, vegan junk food, vegan travel. Bookmark the permalink. I love the term ‘to eat list’ – it’s exactly what I have whenever I go anywhere new! I tried Temple of Hackney a while back and wasn’t mad keen for it, but I hear so many people recommending it, I know I definitely need to give it a second go. Hopefully you’ll find something more to your liking the second time around! The popcorn chicken looks amazing! 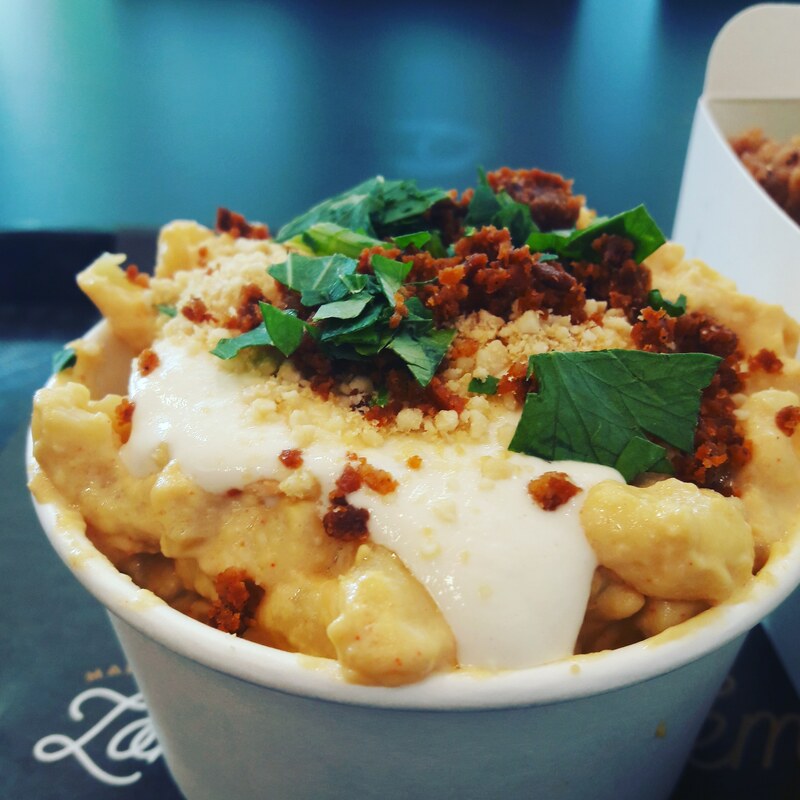 And the mac & cheese sounds great, too! It was such an exciting meal, really different from anything we get in Prague! Mmm…. sounds yummy! I wish there were more breaded “chicken” dishes here. I am sure they exist, I just never think to get them lol. I saw the “hail seitan” bags from the store. I need one! XD Sounds like a mix of KFC and a burger joint. KFC doesn’t sell burgers, and have more “dinner” foods like green beans, mashed potatoes, biscuits, etc. This kind of chicken dish is basically my favourite mock meat. I hope something similar pops up for you, I just assumed this kind of vegan joint would be quite common in the US as KFC is so huge.